Personalized Therapy for Osteoporosis – The Future of Osteoporosis Treatment? It would be simpler if only one or two genes caused osteoporosis and put people at risk for the disorder, but Nature has made it difficult. There are in fact dozens of genes that contribute to the susceptibility to osteoporosis. Some of these genes have been confirmed as risks and some are strongly suspected to be candidate genes, but we can classify them into three metabolic pathways. (1) the estrogen pathway, (2) the RANK/RANKL/osteoprotegerin (OPG) pathway, and (3) the the Wnt/ß-catenin signaling pathway. By intervening in these pathways, scientists may be able to construct new treatments for osteoporosis. This is called personalized treatment in the medical research world, although it is not truly personalized. If it ever gets going, patients would be tested for which genes appear to be behind their osteoporosis, and the intervention would be targeted at that pathway. The treatment isn’t strictly personalized, but it is more specialized than the general treatments that do not take into account genetics. This is the model that has been started to be used in cancer treatment, another area where scientists are excited about the prospect of personalized treatment. One challenge is that the field of pharmacogenomics is quite new and the scientific community is still working out how to interpret how genes shape the onset and morphology of disease. Studies have produced conflicting information as to how the genes influence bone mineral density. However, the hope remains that someday medicine will be able to use an individual’s genes and knowledge of the person’s history to craft a personalized treatment. 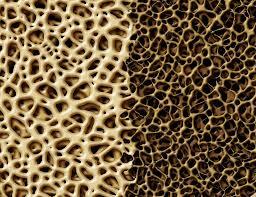 Identification of osteoporosis phenotypes is a needed step to get there, and research remains to be done. A research approach called the genome-wide association study is now looked at as the best path to figure this stuff out. As research continues, new genes may be found and could be classified into one the three metabolic pathways or new pathways could be identified. The genes that influence the development of osteoporosis will probably include both common and rare variants. New knowledge of genetics may hold promise for personalized medicine, improving both the understanding of the pathogenesis of the disease, and also offering methods for prevention and treatment. Scientists have also developed plans for a tiny sensor that would be implanted to a bone fracture. The sensor would allow treating doctors to monitor how the bone is doing post-surgery. Information provided would include the load and strain on the bone where the sensor is. Follow-on treatment decisions can be informed by this information. More info on genetics and osteoporosis treatment.